A summer twist on an anti-inflammatory classic. It always make me laugh why a golden milk latte is called a latte because it doesn’t contain any coffee! 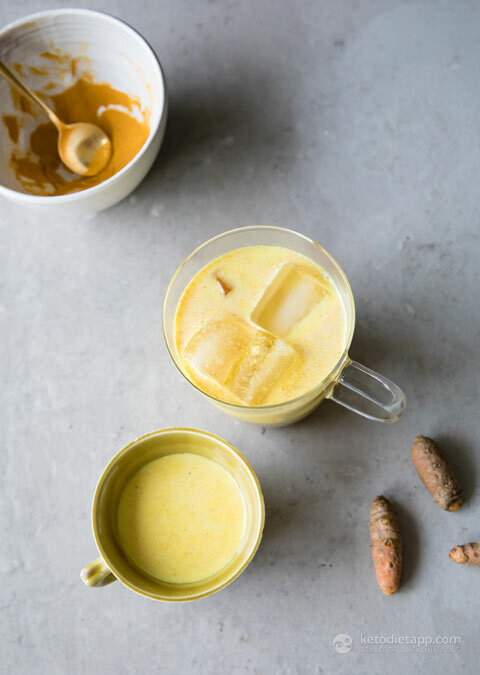 Turmeric is way better for you than coffee anyway. 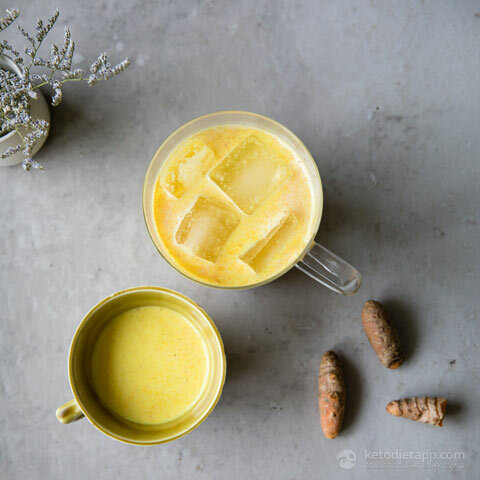 Turmeric is a powerful adaptogen and just like ginseng, green tea, maca or ashwagandha, it’s great for your health in so many ways (More about health benefits is in the original recipe for hot Golden Turmeric Milk). 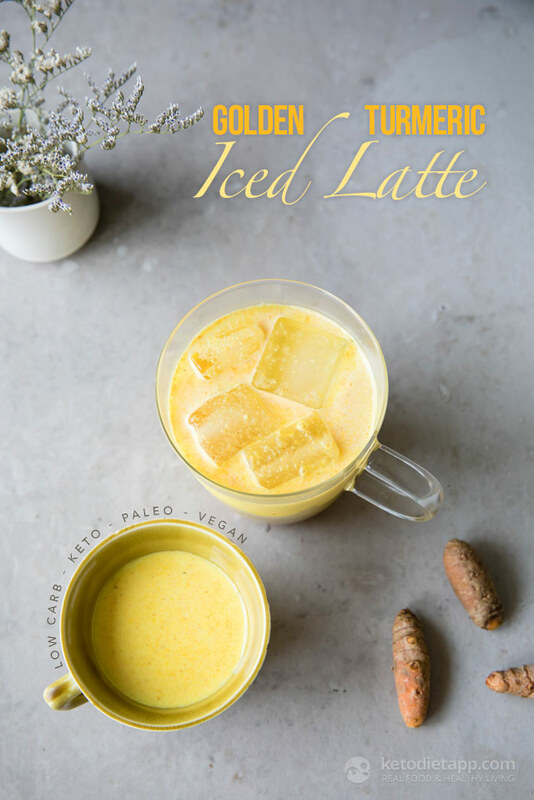 Need another excuse to give this Keto Iced Golden Milk Latte a try? Ok, one more, it tastes delicious! It’s dairy free too so if you’re Keto Vegan this one’s for you. Note: a regular serving is 1 cup, a small serving is 1/2 cup. 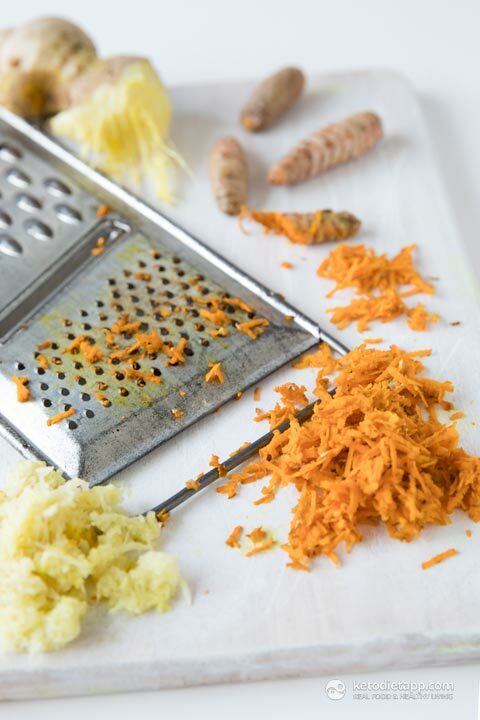 Grate the ginger and turmeric. I’d recommend using protective gloves as the turmeric will stain your fingers. Same applies to your kitchen work top or chopping board so best to avoid your most loved surfaces. 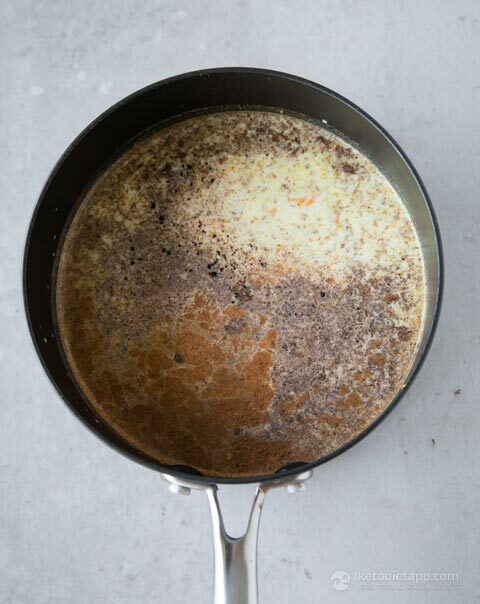 Place the coconut and almond milk in a pan . Add the grated turmeric, ginger, vanilla, black pepper. Optionally, add erythritol and MCT oil (extra energy boost). Bring to the boil and simmer for 5 minutes. Turn off the heat and allow to stand for 5 minutes. Strain through a muslin cloth and discard the spices. Option to add the extra coconut oil, my favourite, stir and pour into a hand blender and pulse until frothy. Allow to cool. Option to then place in the fridge for approximately 15 minutes until chilled. Place ice in a glass and pour over the Dairy Free Iced Golden Milk Latte. Store in an airtight container in the fridge for up to 5 days. The spices will settle, so simply give the golden milk a quick stir before serving. Hi I have an allergy to pepper is there another solution to help absorption of the turmeric? 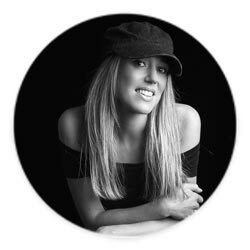 Hi Renee, if you cannot have pepper, then you can skip it. Fats in general improve the bioavailability of turmeric too (although both fats and pepper are better, they are not necessary). The recipe is quite high in fats so you won't need to add the additional MCT oil (at least not for this purpose). I hope this helps!